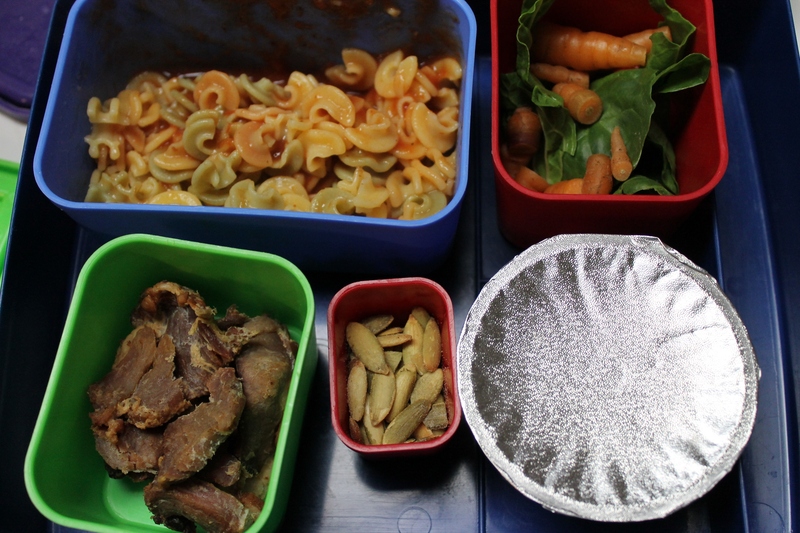 The week of October 24th was a weird week for lunches. My son was ill and was out of school for a couple days. My husband stayed home one day and I stayed home the other. It’s times like that when I wonder how single moms do it. He ended up eating this lunch at home with Daddy. I know I offer a lot of bacon. He loves it (and so do I) and I think it’s good for him. And I’m finally going to ditch the applesauce cups. They might be convenient, but they are a waste of plastic. Child care menu: Turkey hot dog, rotini pasta, baby carrots with ranch dip, applesauce, Italian bread. 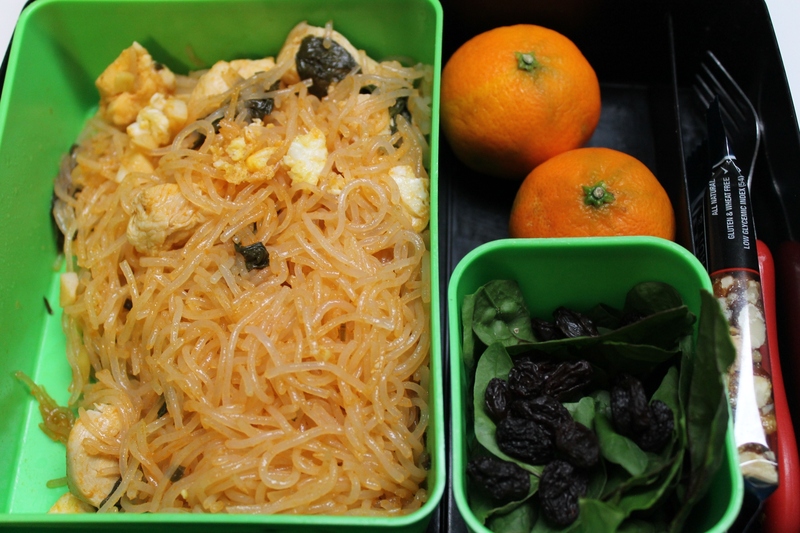 I made pad thai with jarred pad thai sauce and mung bean noodles (from a package). I told my husband that I will master pad thai before I die. 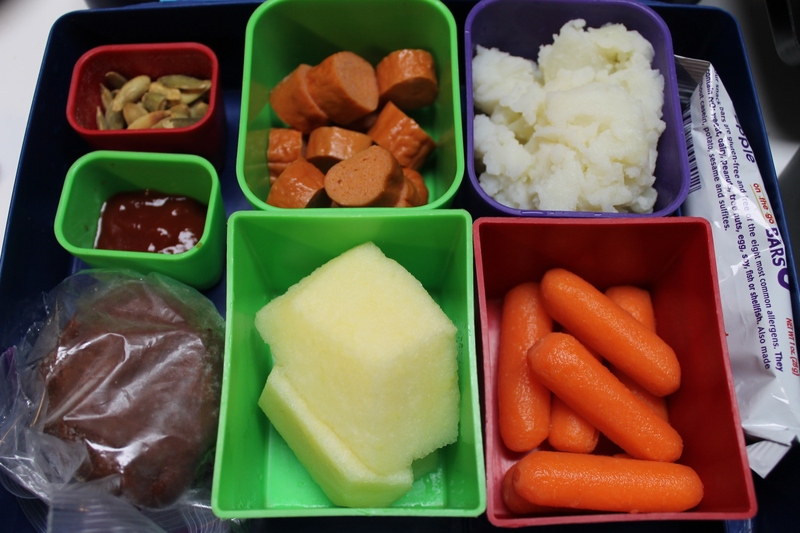 Child care menu: Turkey and cheese wrap, mashed potatoes, corn, orange, rye bread. 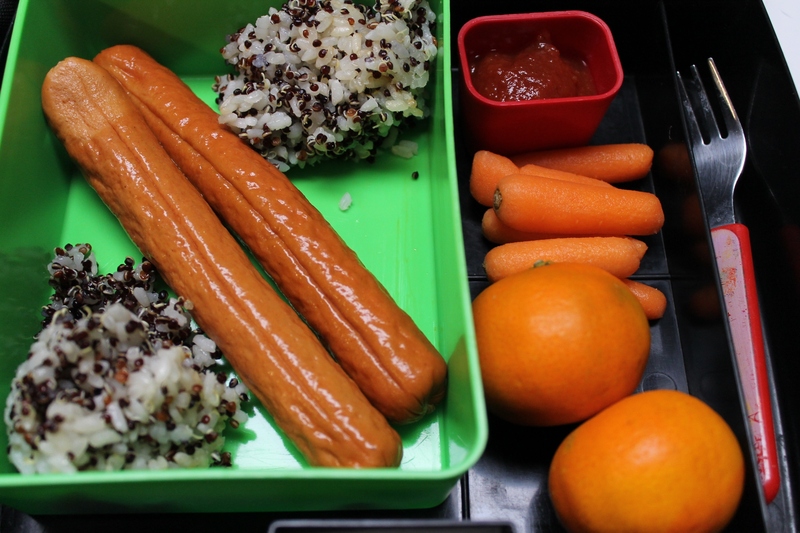 Yes, I sent hot dogs in my son’s lunch. I so rarely serve hot dogs at home, but the night before I was desperate to get something on the table. Plus the new child care does have turkey hot dogs on the menu. I have to admit that I do enjoy a *good* hot dog. I don’t know if it’s cultural or what but I really like eating sausages. I am least 1/8 German after all! Because I don’t serve hot dogs for dinner very often, my son isn’t a huge fan (and neither is my husband). 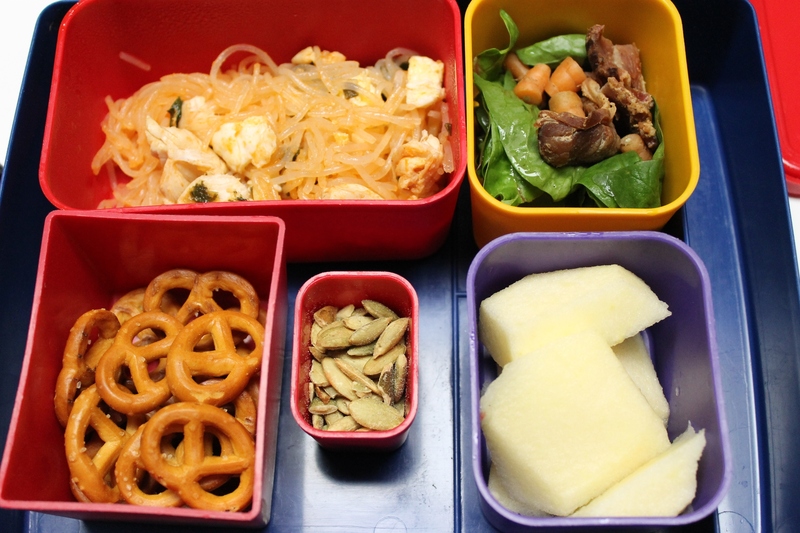 Child care menu: Chicken nuggets, pasta, mixed veggies, cinnamon sliced pears, wheat bread. I have discovered the wonder of roasting a whole chicken. It’s cheap (costs about $5 at the grocery store), easy (350 degrees for an hour), and there is a ton of chicken (always enough for leftovers and lunches). Roasted beets are DIVINE. There’s only one problem with beets: you will have pink pee, etc. Just be prepared. How did I make the pad thai? It’s not magic — I read the recipe on the back of the jar. I’m not able to “wing” things like this and so I think the pad thai was really good for a first effort by a non-Asian. Can you tell I was pressed for time? 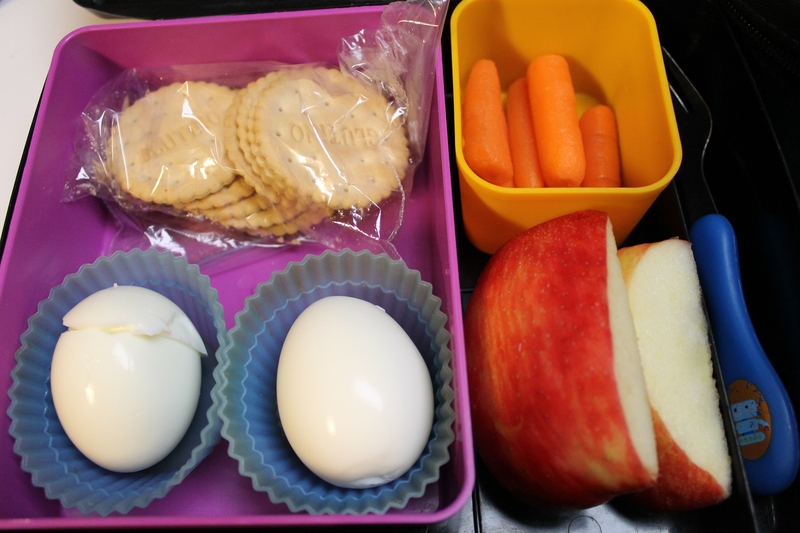 Have you noticed that the lunches at the end of the week are less complex? Yeah, I was running late. It’s my life story. Yep, it was another crazy morning. I think Friday morning lunches are the worst most of the time. I’m usually running low on lunch containers too. I should be more disciplined about washing dishes mid-week. My husband likes only plain quinoa so if I serve black quinoa, I cut it with another grain, usually rice. I bought some sushi rice (short grain) on sale and threw that in the pot with the quinoa. My husband and son love rice, but my son hates quinoa. He refuses to eat it. We got Charlie to eat a few bits of quinoa by telling him that Aaron Rodgers eats quinoa. Yes, he is a budding Packer fan (what can I say, I’m from Wisconsin). I asked my son if he wanted to call Aaron Rodgers and talk to him and he was thrilled. I had to fake it on my phone, but of course Charlie believed me. As I was ending my “conversation” with Aaron Rodgers, I asked my son if there was anything else he wanted to say to Aaron Rodgers. Charlie said there was. I held the phone up to Charlie and Charlie told Aaron Rodgers, “I ate quinoa! !” My husband and I both nearly died laughing, but my husband scolded me not to do it again. Of course tonight we ended up phoning Aaron Rodgers to tell him about my son running, falling on the plastic dustpan, getting a scratch, and needing a bandaid. Oh boy, what have I started! I think Charlie is onto something, even at 31 I have made up conversations with Aaron Rodgers. What a dreamboat. Sigh. 😉 Go Pack! That is the cutest story ever about Aaron Rodgers. Who knows? Maybe he does like quinoa. I’m interested that your daycare lets you bring lunches for your son. At the day care I work at, we can’t bring in any food due to allergies. We have one child that is Kosher, and he can bring his own snack, but it is prepackaged things that his parents pack. 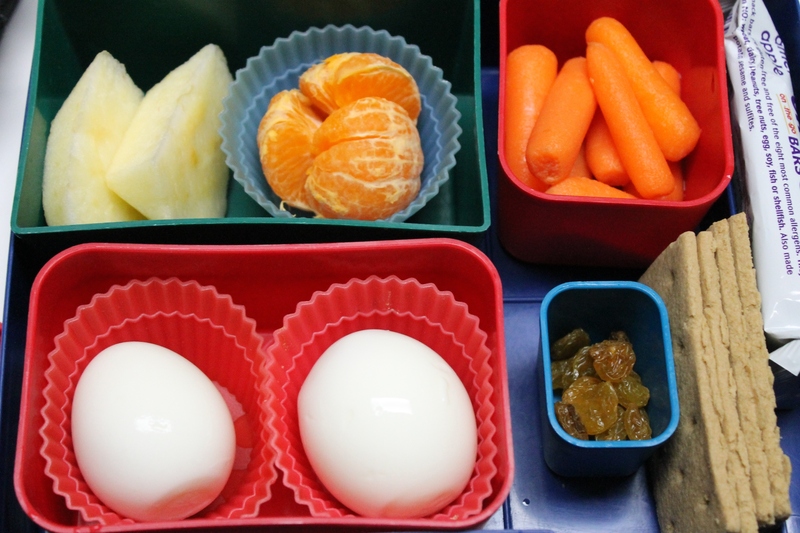 One of the parents want to pack a lunch for their child, but the day care will not allow it because of the risk of allergies. If a student has a dietary need that is different from every one else, they need to have a doctor note. On birthdays parents can bring in uncut fruit or vegetables for the cook to prepares it for the room. I’m glad your daycare allows you to bring food for your son. 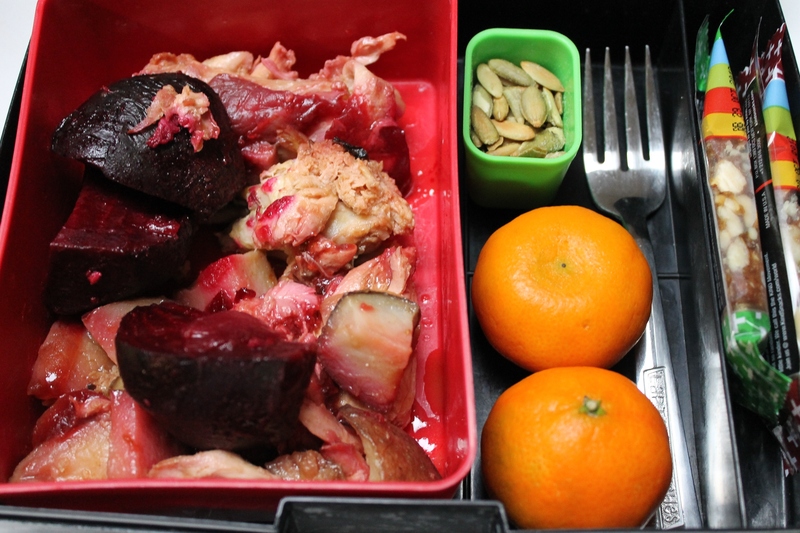 If you like roasted beets, you might like the recipe we use at the Jr High I work at. It is called Beets and Sweets. It is 1/2 diced fresh beets, 1/2 diced fresh sweet potatoes, with a little garlic and olive oil. Just roast them in the oven together until they are soft. Our students are learning to really like them, and will take the beets much better when mixed with the sweet potatoes. What pad thai sauce do you use?